Our Coral Springs Personal Injury Lawyers have represented hundreds of people that have been injured in both Coral Springs, Florida and throughout the state by no fault of their own. Our lawyers are available by appointment to meet with you at our Coral Springs office, your home, the hospital or at a location that is most convenient for you. In 95% of the Coral Springs, Florida accident cases that we handle our accident attorneys can tell you within a matter of minutes whether you have case. The best way to know if you have a case is to call us for a free phone consultation. Whether you are a Coral Springs resident or were injured in Coral Springs, our attorneys are available to discuss your recent accident. The city of Coral Springs, Florida is a fast growing community in Broward County located twenty miles north of Fort Lauderdale. Since its formation, the city has maintained strict codes to maintain its aesthetic appearance. 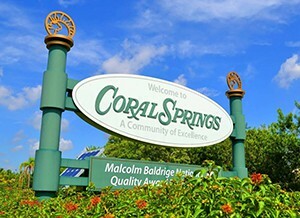 Ironically, Coral Springs contains no “springs” as its name would suggest. Instead, Coral Springs is known for its low crime and family-friendly atmosphere. Coral Springs has a large amount of commuters whom rely on the Sawgrass Expressway, Interstate 75 and Interstate 95 to get to work daily. This large volume of drivers, especially on the dangerous I-95 causes slowdowns and traffic accidents. In 2008 alone, there were 97 crashes which led to 109 fatalities on the Broward portion of I-95 alone. Additionally, due to the temperate climate of Coral Springs, residents are afforded an active lifestyle, including motorcycling, bicycling, and other outdoor activities. At times, these activities can be dangerous and regrettably, accidents do occur. As such, there are many hospitals to serve the population, including Coral Springs Medical Center and North Broward Medical Center.